Last night, I cooked the best dish of my life. 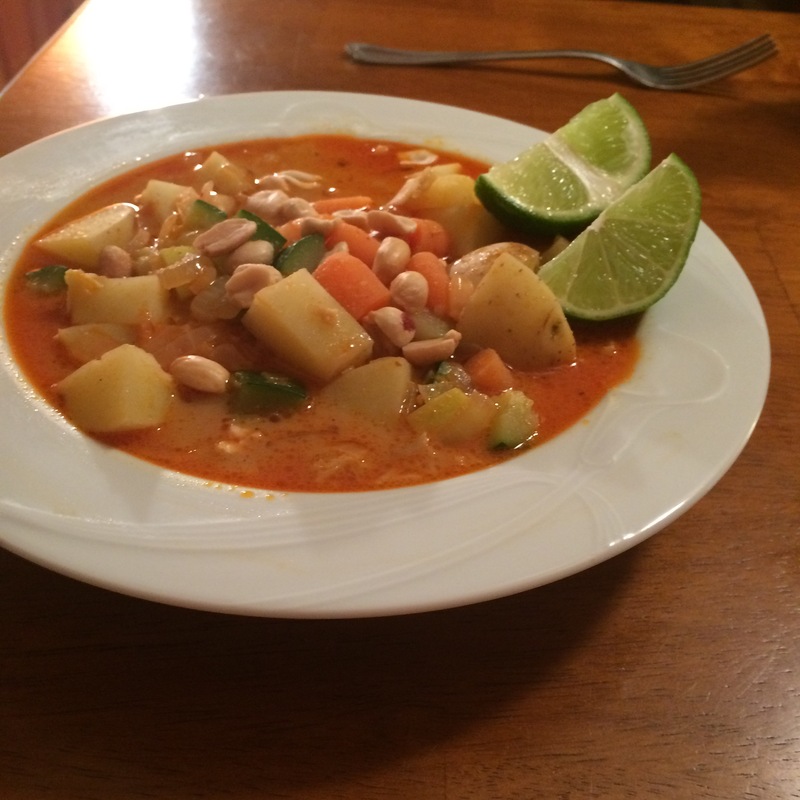 No joke, no hyperbole- the massaman curry I cooked after a long, fun day of errands was the best thing I’ve ever made! So I figured I had to post my recipe. 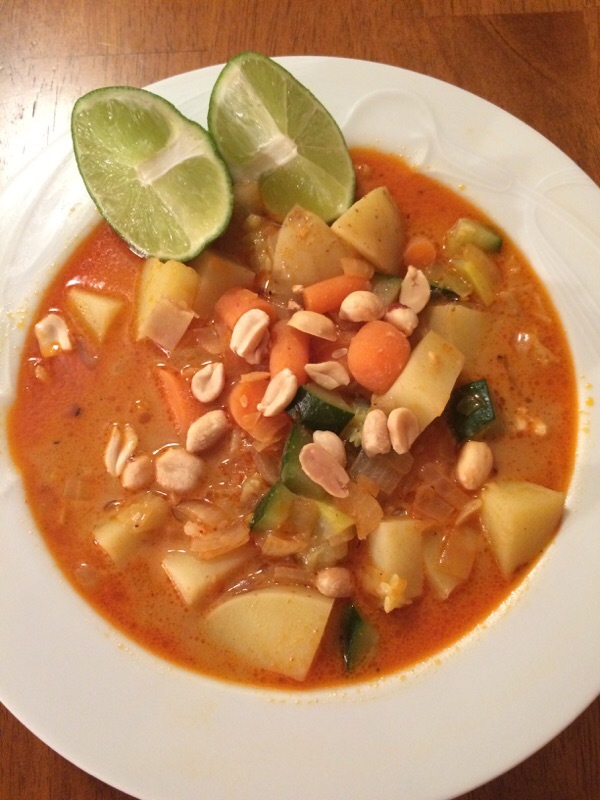 Massaman is a rich, peanutty, mild Thai curry that most people love! Just a note- I have made this dish completely from scratch before, and this time I used a jarred red curry paste. I found it tasted better with the paste than with my scratch spice mix. Boil the evenly cut potatoes and carrots first. 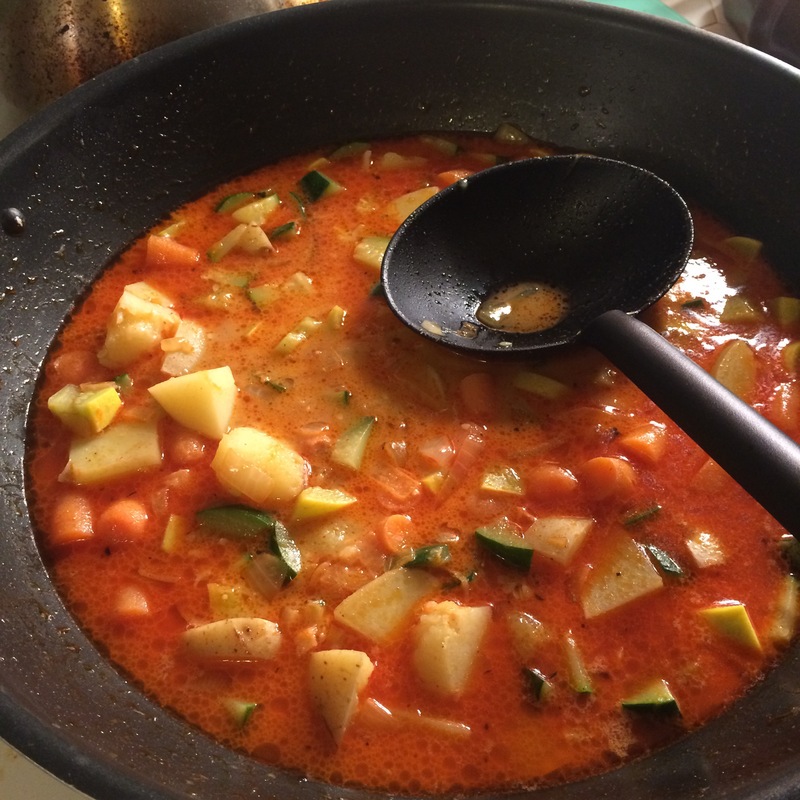 I cut up the squashes and put them in my wok with 2 cups of veggie broth and a can of coconut milk. Dice up your onion and put it in a large pan with 3 Tablespoons of vegetable oil. I used veg oil instead of my usual coconut because it is more liquidy and tasteless. After the onions have cooked for a few minutes, add 3 Tablespoons of curry paste, 3 Tablespoons of brown sugar, garlic powder, and a little salt and pepper. After you have mixed all of that in, add a big spoonful of peanut butter. I use a natural one to avoid hydrogenated oils. Keep stirring it and tasting it. I had to add a little extra plain sugar and salt. I also added the juice of one lime. This dish is very comforting and decadent, so pay close attention to taste as it cooks! After the onions are done, add the whole onion and thick sauce mixture into the coconut milk broth in the wok. Stir it all around! Cook up some brown rice (short grain goes nice) and crush up some peanuts. Cut up some more limes and serve up the your delicious curry! My partner said this was the best dish he has ever had, and bragged all about it at work. 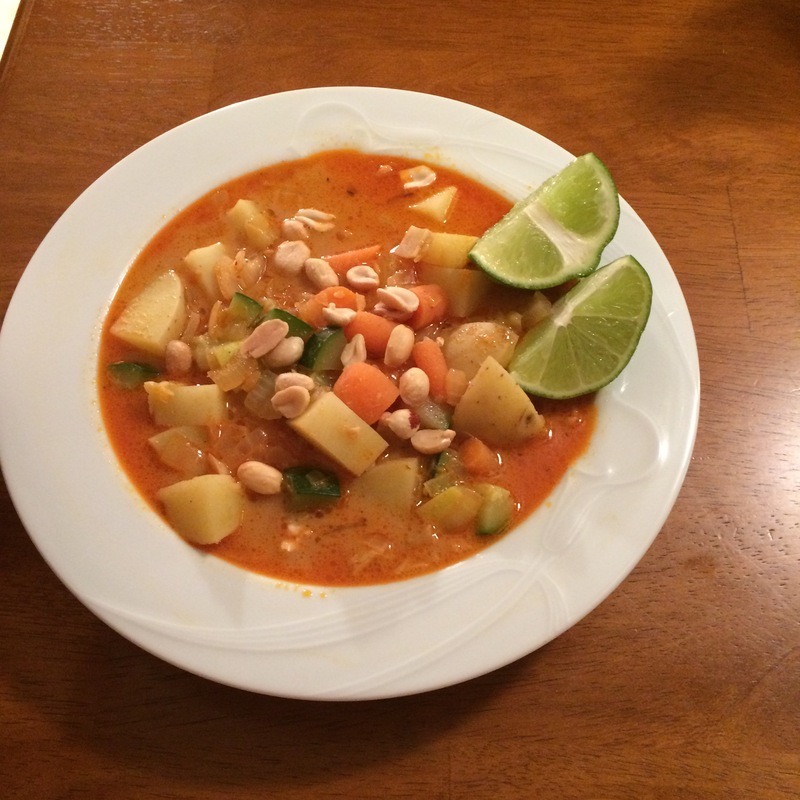 I think even if you haven’t had this curry while out at a Thai restaurant you can still make it and like it. Because of the potatoes, carrots, and peanuts, it is mild and palatable even to people who don’t like spicy or crazy dishes. Let me know if you make this dish!! Do you like making curries? I love the process, probably more than cooking any other kind of food. Another great part of this dish is that no animals were harmed in the making of this dish at all! I didn’t even have to use tofu or anything- the dense veggies carry the dish without meat. Can’t wait to try this recipe out! !